Dr. Tiwari has immense experience as an Oncologist in treating all types of Cancer patients in leading centers in Gurgaon. As a Professor of Medical Oncology, he has successfully done various complex onco-surgical operations including open, Laparoscopic and Thoracoscopic procedures. He is also well versed in diagnostic and therapeutic endoscopic procedures. He has a special Interests in Surgical Oncology (GI & Breast), Breast Cancer (Breast conserving surgeries & Oncoplastic breast surgeries), Colorectal cancers specially treating laparoscopically, Hepato Billary and Pancreatic cancer, Robotic Surgery. 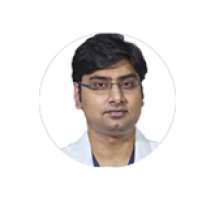 He is trained in surgical oncology from the Dharamshila Cancer Hospital, New Delhi. He has over 6 years of experience of satisfied patients in his field. He has published numerous papers and research articles in journals of national and international repute. He was awarded Certificate of merit for standing first in medicine MBBS final year and a Certificate of honor in physiology MBBS first year. He is under membership of Delhi Medical Council and UP Medical Council. He is a Senior Resident in the Department of Surgical Oncology, Dharamshila Cancer Hospital, New Delhi.